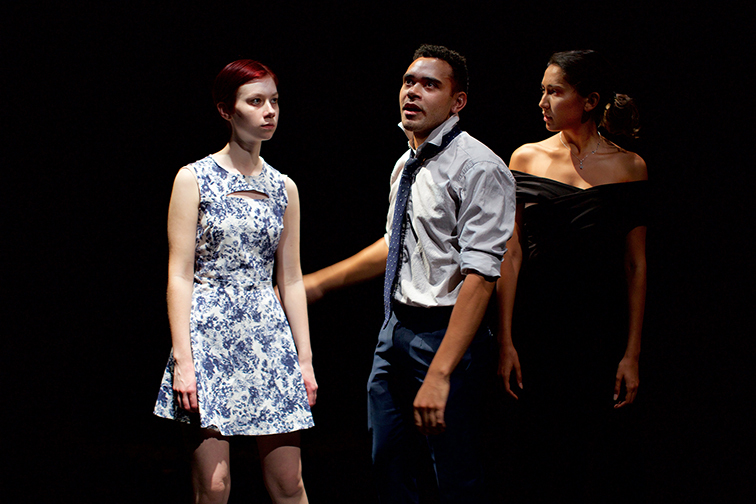 ATYP (Australian Theatre for Young People) present, INTERSECTION - a collection of short scenes/monologue by 10 young writers in the ATYP Theatre, Wharf 4. Walsh Bay. 1st February - 18th February. INTERSECTION is a program from 10 playwrights: Peter Beaglehole, Angela Collins, Thomas De Angelis, Izzy McDonald, Charles O'Grady, Suzannah Kennett Lister, Zoe Ridgeway, Jordan Shea, Lewis Treston and Honor Webster-Mannison. 19 actors under the Direction of Katrina Douglas tackle seven duologues, one trio and two monologues. The material is mostly dealing with the journey of adolescence in this decade of the twenty-first century. Ms Douglas has Directed the works with care, some of the performances very arresting, and found a way to marry the varied subject matter to fit a logical coherence in presentation. The best of the short 10 minute works, for me, were: THE TRACK AND THE CHURCH, by Zoe Ridgeway, that had a refreshing vernacular captured well, performed by Hudson Musty and Jackson Williams. LITTLE DIFFERENCES, by Joel Shea, with pleasing performances from Rebecca Gulia and especially, Elliott Falzon. PRAY 4 MOJO, by Charles O'Grady, examining the plight of the 'different' in our society with two poignant performances from Kurt Pimblet and Adam Stepfner. I found the scenes a great relief and noted that the two monologists suffered from the contrast to interaction between players. The Set and Costume Design was by Isabel Hudson, Lighting, by Emma Lockhart-Wilson and the atmospheric Sound Design, by Tom Hogan.